Want to work in TV or Film!! Everyone has their dream job and my one is to write TV programmes or Films!! The prospect of writing a TV programme or film is really amazing. I want to do it so badly. To be able to work with a team, bouncing ideas off one another, creating a brilliant plot, characters and twists is a dream job! The feeling of creating a story is a great feeling, letting your imagination takeover you creates the best of stories. I do that when I’m writing. Whether it’s a piece of work at Uni or Endurance or my next novel. I am constantly writing and thinking, so for a chance to do it for a living, would be fantastic to develop the idea from my head, onto paper, onto the screen is what I want to do! Why don’t you check ‘Endurance’ out for yourself? Go buy yourself a copy. Give it a read and who knows, you might enjoy it! If you get time, review it on Amazon, Barnes and Noble or The Book Depository… Or all three! 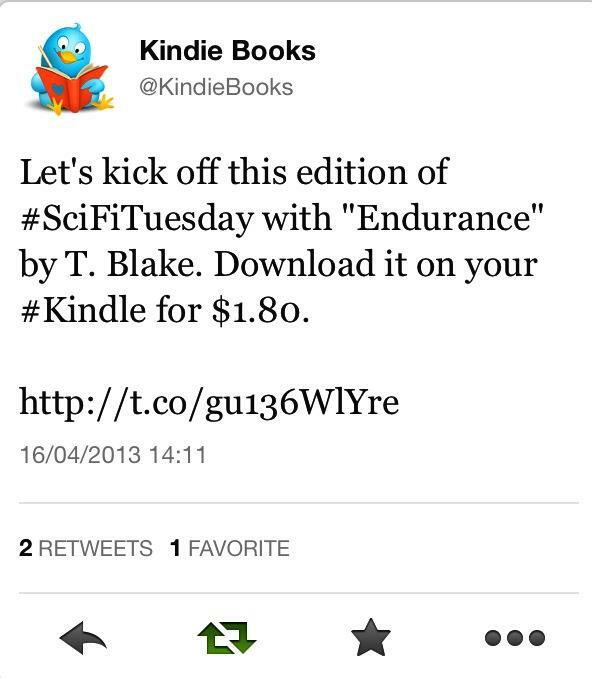 Endurance was mentioned on Twitter by Kindie Books. Buy your copy of Endurance on Amazon paperback RRP £3.99/$6.33 or eBook version £1.24/$1.89. 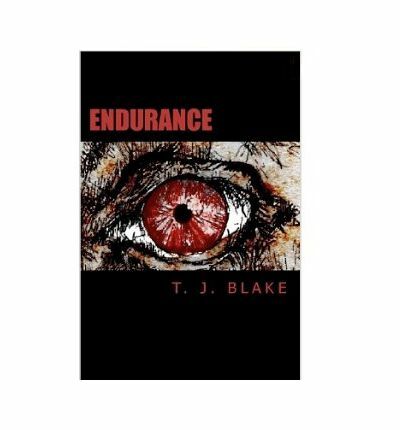 Barnes and Noble, The Book Depository and Super Book Deals also sell Endurance on paperback. Buy Endurance! It’s unpredictable throughout. Full of mystery, suspense, action and gore. I have plans for a sequel of Endurance. I have a lot of material in my mind, lots of possible outcomes, lots of characters and lots of scenes. I’m ready to write, but it’s going to be difficult to top Endurance and I’m waiting for more people to read it and of course review it. So here’s my constant reminder. Buy Endurance. It’s on Amazon, Barnes and Noble, The Book Depository and Super Book Deals. Read it and enjoy it. If you have time, please, please, please review it! So I went to the Warner Bros studio today to go to the Harry Potter World. Really good day and I would recommend it to any Harry Potter fan or film fan for that matter. On the way there and back I noticed that by the Motorway and slip roads, there are fenced off areas of land, with a grassy slope, where sheep and lambs are running around freely. But I was thinking, isn’t it bad to have the lambs so close to the road, inhaling the fumes and eating grass that will also be affected by the car fumes? Another negative is, they are a distraction to drivers because the lambs are pretty cute! It also makes you feel a little peckish for a roast. HP world was the highlight of the day though. You should definitely go, you’ll love it. Don’t forget, buy my book Endurance, it’s available on Amazon, The Book Depository, Barnes and Noble and Super Book Deals. So pay day has arrived, but for some of you, it could be next week or of course a completely different time. It’s the thing that we all have in common for liking, a load of money going into your bank account… until it’s taken out by all those companies and bills that you’re paying for. But because it’s pay day, maybe now you can buy Endurance on paperback or eBook. Here are all the links you need to purchase your version of Endurance. Pick the one that best suits you. 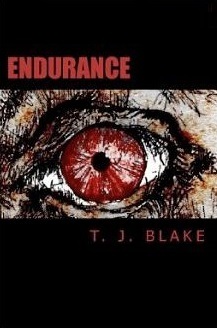 Endurance is available on not only Amazon UK and Amazon.com but on all the channels. So go on, buy it now, it’s pay day! Positive Reviews for Endurance… So far! I have got some positive reviews for Endurance so far. So glad to see that people out there are enjoying it. I would appreciate as many reviews as possible. So if YOU have read Endurance, then why not post a review on it’s Amazon, Barnes and Noble or The Book Depository page, or all three? I would really appreciate as much feedback as possible. Like I said in my previous post, it doesn’t matter if you’re not a professional reviewer, everyone’s opinion counts in my eyes. It would allow me to improve and please more people with my novels in the future. So don’t be shy of reviewing, have a go at it. Rate it out of 5 stars and write what you thought of it on either Amazon, Barnes and Noble or The Book Depository or put the same review on all three websites! If you haven’t bought the book yet, please buy it and then review it. It’s available as eBook and paperback on any Amazon site. Paperback on Barnes and Noble, Super Book Deals and The Book Depository. Just thought I’d put a post about my manky toe for the first time on here. So after being in and out of the local docs and seeing many docs who didn’t know what it was, it took 6 months until finally progress was made. Went to the Podiatry Department and saw someone who actually knew what they’re doing (except Dr Christian from embarrassing bodies cause he knew). She knew what it was and confirmed that it was the tumour called Exostosis (Google it). So now I’m waiting for X-rays and then I can have the manky nail and new nail (under the manky one) taken off and the bone underneath the nail and skin chizzled (if that’s the right word) back to normal. So maybe this story can have a happy ending? So there you go. That’s my exciting and disgusting story of the manky toe so far. I hope you enjoyed it. I think I could definitely write a novel about it… TO BE CONTINUED Will there be a happy ending?